Our Society no longer exists as of December 30, 2001. We could not find enough people willing to serve as officers and to do the necessary work needed for an effective organization. Properties of the Society were donated to 6 agencies in the area who are oriented toward history and genealogy. 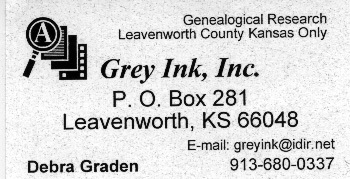 Unfortunately the Leavenworth County Genealogical Society has been dissolved. As of 31 December, 2001 the Society no longer exists except as a part of history. For those who have a need for family research in this area, we do have a person who will perform queries as a part of her personal business. A number of agencies benefited from the LCGS, as many received copies of manuscripts, films, books, etc., that are duplicates of items already in the Leavenworth Library. Office keeping supplies were distributed. Remaining funds were distributed by a formula to those organizations as well. This page will continue to be available for some time, as it does provide a great amount of information for those doing research in this area. LDS FHC in Leavenworth, Tuesday, Wednesday, Thursday, 9:00 A.M. - 1:00 and 5:30-8:30 P.M.